Podcast host is Mike Sanders. As senior solutions expert at NetDocuments, Mike shines at understanding and translating business and customer needs into technical specifications and then configuring and implementing solutions that deliver on those requirements. Mike and his special guests featuring in the Legally Cloud episodes chat and discuss everything from the ‘so-what factor’ of the latest legal IT industry trends to challenges and hot tech topics. Legal IT Professionals talked to NetDocuments' EMEA Marketing Director Josie Jakob about the dedicated podcast channel. NetDocuments launched a dedicated website for podcasts: Legally Cloud. What would NetDocuments like to achieve with this initiative? 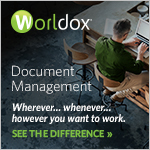 We’re hoping it’s going to become a go-to place for valuable document management and tech insights for legal. 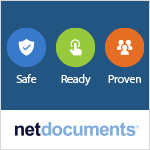 Not just around NetDocuments but broader topics that are of interest to our clients. The goal of the podcast is to provide an educational and entertaining forum to discuss legal technology in the cloud. Your colleague Mike Sanders is assigned as host of the podcast site, what exactly will be his role? For most of the cloudcasts Mike is the host and shapes the discussions. He’s got a really warm and informal style which is refreshing to listen to. He works with clients all over the world so he’ll be bringing that context, along with his infectious enthusiasm and sense of humour! There are a couple of episodes already posted, but can you tell us more about what content that can be expected? We will continue to add podcasts on a regular basis - we want to make it worthwhile for clients to subscribe. Listeners can put in topic requests and we’ll then try to create a relevant cloudcast. While we do want to provide updates on what NetDocuments is doing, we also want to expose other legal cloud technologies to the listeners. The scope of the podcast will expand as guests come on the show to be interviewed and talk about their experiences in the cloud. For all of the above and just like we say on the micro site - so they can learn on the move and laugh along the way. And who wouldn’t want to hear a story about walking cheese??? Want to know more about NetDocuments or Legally Cloud? Visit NetDocuments at Lexpo'19 in Amsterdam on 8 & 9 April.